Collection of original printed Circulars, Letters Patent Synopsis, etc. describing his inventions, with a number of offprints (with duplication) from the The Mining Journal (1857-58) claiming James’s father, William James, to the “The Originator of the Modern Railway System”. From papers retained by the James family. 6 different Circulars and Patent announcements, with a collection of offprints, folds, minor blemishes only, generally in good condition. Undated, mostly 1850s. William Henry James (1796–1873) assisted his father in his survey of the Liverpool and Manchester railway. He subsequently commenced business as an engineer in Birmingham, where he made experiments upon steam locomotion on common roads. He took out patents for locomotives, steam-engines, boilers, railway carriages, diving apparatus, &c., and he is commonly stated to have anticipated Stephenson in the application of the tubular boiler to locomotives, but this is an error, James’s boiler being what is known as a ‘water-tube’ boiler. 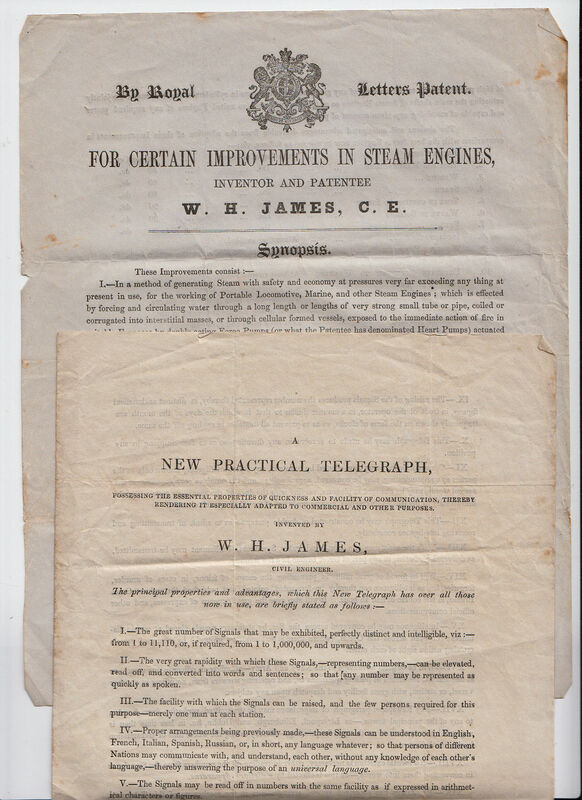 This interesting group comprises: A New Practical Telegraph; Certain Improvements in Steam Engines (2); A New System of Transit for Passengers and Goods; Improvements in Heating and Refrigerating; Universal Peace throughout the World …a New Peace-inducing Ststem of Aggressive Warfare.